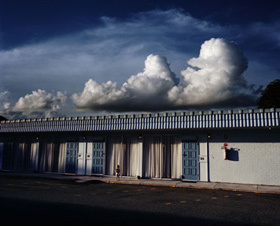 Stills Gallery will be showcasing new works by award winning artists Narelle Autio and Trent Parke at Depot Gallery, 2 Danks St Waterloo from 15 May to 3 June, 2006. Autio's vibrant images of Australians at leisure have won her impressive national and international acclaim. Her latest works push the expressive capabilities of photography. 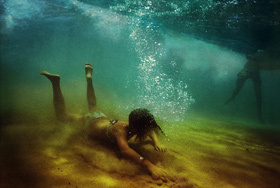 The figures in her underwater tableaux, despite being ordinary people enjoying a swim at the beach, seem almost posed for dramatic effect, as if on a stage. The play of colour and light in the photographs gives them a magic and painterly quality. Also on show will be new works by acclaimed photographer, Trent Parke, the only Australian ever to be an associate member of the prestigious Magnum Photo Agency. Parke's latest images continue his exploration of urban spaces in colour. In these works he has focused on the line of urban development that snakes its way along the coast of Australia. While Autio's figures swim in an underwater playground, Parke's subjects negotiate a proliferation of high-rises, take-away shops, faded signs and electricity wires. Copyright © Stills, 2019 | All images are copyright of the artist.